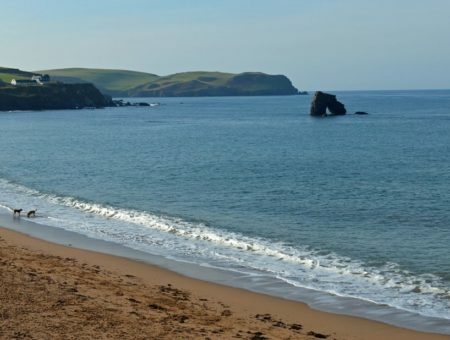 This article is part of the South Devon Beach Bible – your comprehensive guide to South Devon’s most beautiful beaches. Soar Mill Cove beach is accessible on foot (a one mile walk minimum) or by boat. To reach the beach, you can walk along the South West Coast Path from Bolberry Down National Trust car park (1 mile), Hope Cove (3.5 miles) or, in the other direction, Salcombe (just under 7 miles). Bolberry Down car park offers the closest public parking facilities to Soar Mill Cove. Sat nav users can use the post code TQ7 3DY, and continue along the track until you reach the car park on your left. Bolberry Down car park is about four miles from Salcombe. Leave Salcombe on Salcombe Road. At Malborough when the road bends right, continue straight into the village rather than following the road. Pass the Post Office and follow this road. With the church on your right, continue straight on. Take the second right (about half a mile on), signposted for Bolberry and Hope Cove. About three quarters of a mile later, turn left at Bolberry, signposted for Bolberry Down. The car park is about 20 miles from Dartmouth. After seven miles you will come to a T-junction by a garage at Halwell. Turn left, joining the A381. You’ll pass through the village of Churchstow. Half a mile later you’ll reach a roundabout. Turn left. Turn right at the T-junction, signposted for Salcombe and Malborough. When you come to Malborough, turn right when the road bends left. Pass the Post Office and follow Higher Town to the church. With the church on your right, continue straight on. Parking, which is charged at £2 via an honesty box, is ample and perfectly located right on the Coast Path. Activities: There are no supervised activities or lifeguards. However, the long sandy beach lined with rocks is great for beachcombing and rockpooling with kids. The breathtaking coastal views start before you’ve even left your car, thanks to the stunning elevated location of Bolberry Down National Trust car park. There are picnic benches just a few yards from where you’ll leave your car, each offering views that easily justify the drive in themselves – but we guarantee that the sometimes-steep walk down to Soar Mill Cove will be well worth the effort. 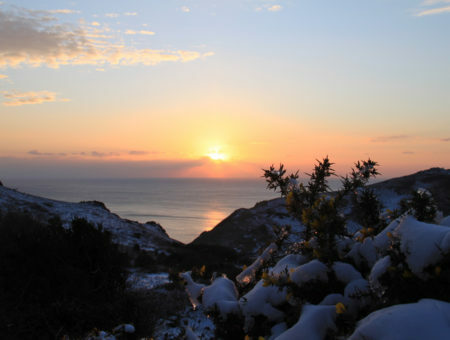 From the car park, make a left along the South West Coast Path to head down to Soar Mill Cove beach. A unique type of metamorphic rock known as Lower Devonian Schist, found only between Bolt Tail and Start Point, dominates the landscape in this part of South Devon. It adorns the highest peaks with ancient crowns, protrudes spine-like to form ridges through the earth, and pours itself into the sea. Watched over by frequent tors, the landscape would call Dartmoor to mind for most of us, expect for the deep green carpeting of grass that’s typical of the South Hams. Unlike some of South Devon’s other remote beaches, Soar Mill Cove isn’t easy to miss. It’s not covered by forest like Dartmouth’s Sugary Cove, for example, or tucked away unnoticed at the bottom of a steep cliff. Part of the joy of visiting South Mill Cove, therefore, is the ever-changing view of the beach you can appreciate as you make your way slowly downhill. Access down to the beach itself is via a choice of paths, either stepped or gently sloped. If you’ve made the journey this far from Bolberry Down, you’ll have no problems reaching the sand. When the tide is out, Soar Mill Cove expands to form a long, sandy beach with a gentle incline. 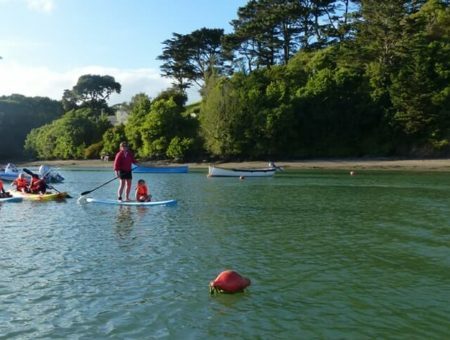 On hotter days, this means the sea is likely to be warmer than you’d find at our deeper-water beaches. Be aware, however, that it’s very rocky and that there are no lifeguards for miles around. Soar Mill Cove beach makes a fantastic spot on the South West Coast Path for a picnic, a few hours of paddling or sunbathing, or perhaps just a quick rest on your hike between Salcombe and Hope Cove. What it lacks in facilities it more than makes up in breathtaking natural scenery, unique geology and glorious seclusion. If Soar Mill Cove is your cup of tea, then you’ll enjoy visiting some of other ‘secret’ Devon beaches. Two of our favourites are Lannacombe Beach and Mattiscombe Sands, both west of Start Point on an especially rugged stretch of our coastline. Find out more about all of our best beaches from our comprehensive South Devon Beach Bible. Fill your next UK break with unforgettable scenery, unspoilt beaches and spectacular walks, and choose South Devon as your destination. Explore all of our properties here.